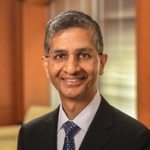 Vikas P. Sukhatme, MD, ScD, is Dean of Emory University School of Medicine. He also serves as Chief Academic Officer of Emory Healthcare and as Woodruff Professor. Prior to coming to Emory, Sukhatme was Chief Academic Officer and Harvard Faculty Dean for Academic Programs at Beth Israel Deaconess Medical Center in Boston and the Victor J. Aresty Professor of Medicine at Harvard Medical School. Sukhatme was born in India and raised in Rome, Italy. He completed a bachelor's degree and then a doctorate (ScD) in theoretical physics at Massachusetts Institute of Technology. In 1979, he received an MD from Harvard Medical School in the Harvard-MIT program in Health Sciences and Technology. Following his residency in medicine and a clinical fellowship in nephrology at Massachusetts General Hospital, he spent two years at Stanford in immunology research. His first faculty appointment was at the University of Chicago, where he was also appointed an assistant investigator of the Howard Hughes Medical Institute. In 1992 he moved to Harvard Medical School and Beth Israel Deaconess Medical Center (BIDMC) as chief of the renal division in the Department of Medicine, and he subsequently received an appointment in the hematology-oncology division. He is also the founding chief of the Division of Interdisciplinary Medicine and Biotechnology at BIDMC. For eight years, he has been the Chief Academic Officer and Harvard Faculty Dean for Academic Programs at BIDMC. Sukhatme's research spans numerous areas of medicine in both fundamental science and clinical care. He has over 200 scientific publications that have been cited more than 31,000 times. His longstanding interest in cancer currently centers around tumor metabolism and tumor immunology and on "outside-of-the-box" approaches for treating advanced cancer. He has conducted studies on genes important in kidney cancer and polycystic kidney disease. Sukhatme's laboratory played a key role in the discovery of the cause of preeclampsia, a blood vessel disorder and a major cause of morbidity in pregnant women. His research also has provided insights into how blood vessels leak in patients with severe infections, and on how new vessels form to feed growing tumors. He has elucidated mechanisms by which statins can cause muscle damage. Sukhatme is known to be equally passionate about teaching medicine and educating communities outside of medical school. He initiated a course to bring MD/PhD students up to speed as they returned to the clinic after their graduate studies, as well as a mini-medical school series for the general public, and one for industry scientists highlighting unsolved clinical problems. According to Alan Garber, provost of Harvard University and himself a physician, "Vikas is a superb researcher with remarkable breadth and sophistication, all in the service of improved human health. He has a deep, discerning intellect and is dedicated to the success of his colleagues and students. Emory is fortunate to have attracted him as dean." Sukhatme also is an entrepreneur, having cofounded several biotechnology companies based on discoveries from his laboratory. Along with his wife, Vidula Sukhatme, he is co-founder of a not-for-profit organization, GlobalCures, to conduct clinical trials on promising therapies for cancer not being pursued for lack of profitability.